Sir Henry Pellatt, the dreamer behind Toronto’s famous heritage site; Casa Loma, was born to his British parents in Kingston, Ontario on January 6, 1859. Ambitious from his youth, Sir Henry Pellatt left his studies at Upper Canada College when he was seventeen to pursue a career in commerce in the family business. By the age of twenty-three, he became a full partner in his father’s stock brokerage firm Pellatt and Pellatt. That year was also marked by his marriage to Mary Dodgeson, whom he met when he was twenty. Even as a young man, Henry Pellatt embraced the spirit of the family motto “Devant Si Je Puis” or “Foremost If I Can”. When he met his bride-to-be, Sir Pellatt had already achieved local renown in 1879 for beating the U. S. amateur champion of the one mile race. 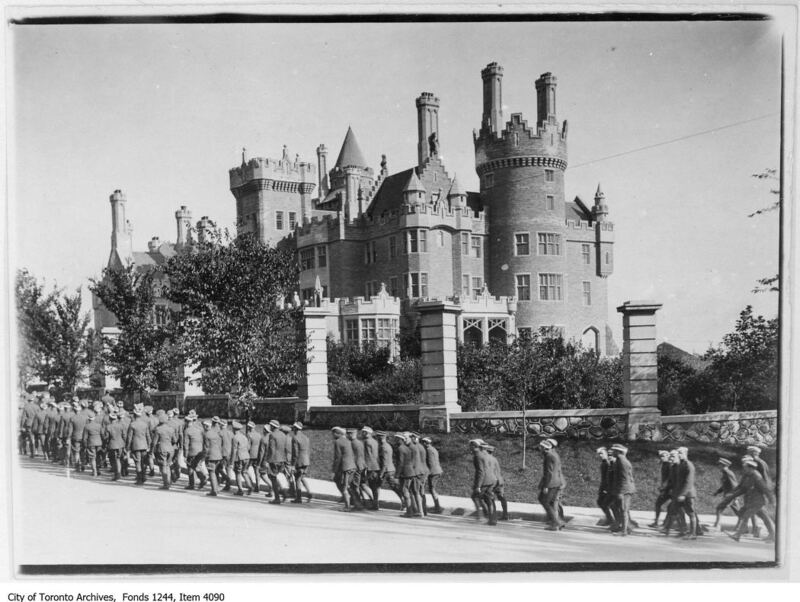 Travels to Europe gave him the love for fine art and architecture, which would spur his vision of Casa Loma-“House on the Hill.” This romantic side was mirrored by his other lifelong passion-his involvement with the military, specifically the Queen’s Own Rifles. As a partner in Pellatt and Pellatt; Sir Henry Pellatt was a business visionary. In the same year that Thomas Edison developed steam-generated electricity, Sir Henry Pellatt realized that supplying electricity could be extremely profitable. He founded the Toronto Electric Light Company in 1883. By the time he was thirty, the Toronto Electric Light Company enjoyed a monopoly on the supply of street lighting to the city of Toronto. In 1892 his father retired, enabling Sir Henry Pellatt to invest with more risk. Despite vigorous discouragement from his friends, he purchased stock in the Canadian Pacific Railroad and in the North West Land Company. As with steam-generated electricity, his intuition was right on target. 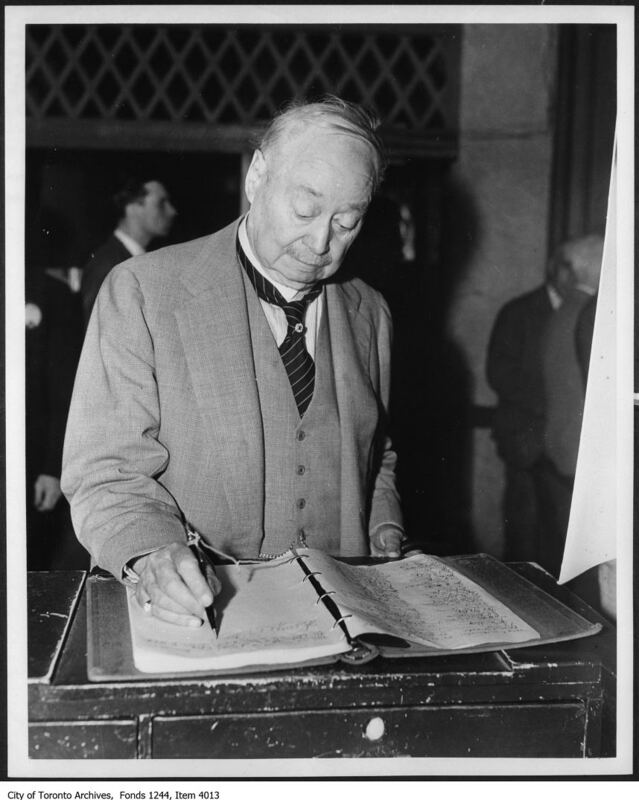 A liberal immigration policy led to the opening of the Canadian West which led to healthy profits from his investments in both the Canadian Pacific Railroad and in the North West Land Company. By 1901, Sir Henry Pellatt was chairman of twenty-one Canadian companies with interests in mining, insurance, land and electricity. In 1902, he and his partners won the rights to build the first Canadian hydro-generating plant at Niagara Falls. He was knighted in 1905 for his military service with the Queen’s Own Rifles. Sir Henry Pellatt’s Midas touch continued through most of his business life. In 1911, armed with a fortune of $17M, Sir Pellatt drew up plans with Canadian architect E.J. Lennox to build his dream home, a castle in the city of Toronto. 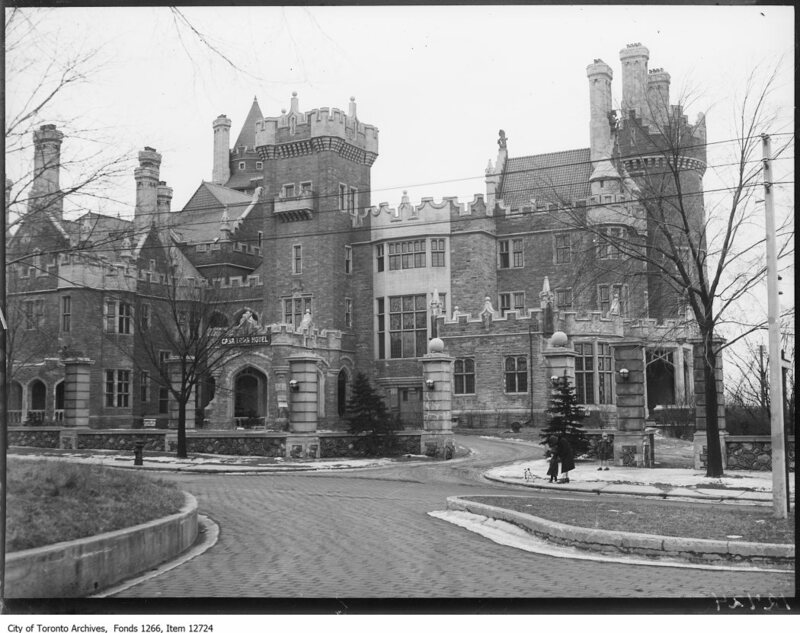 The land on which he planned to build had been given the name Casa Loma by its previous owner, a name that in Spanish translates to ‘Hill House’, Pellatt must have known it was meant for a home. Casa Loma took three years and $3.5M to build. 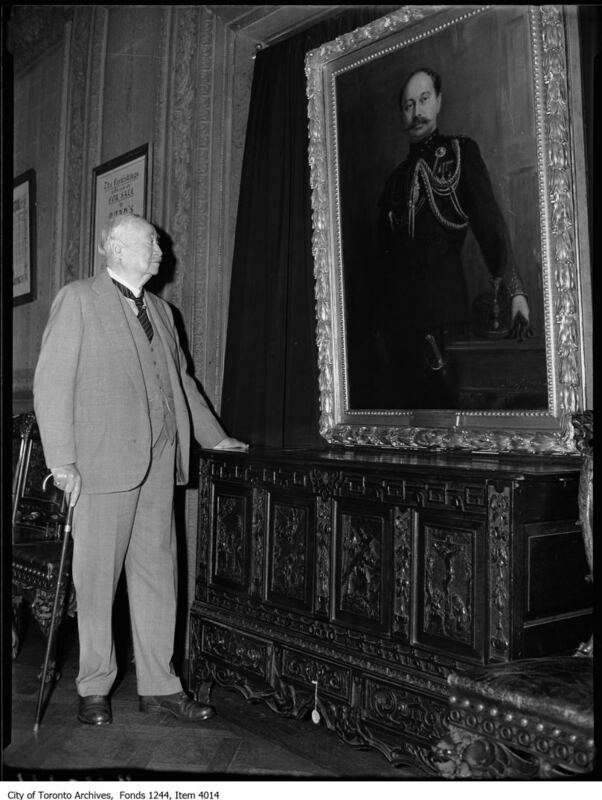 Sir Henry Pellatt filled Casa Loma with priceless artwork from Canada and around the world. Casa Loma stood as a monument to its creator – it surpassed any private home in North America. With soaring battlements and secret passageways, it paid homage to the castles and knights of days gone by. To this day it remains one of the only true castles in North America. Sir Henry Pellatt’s numerous business and military connections demanded entertaining on a large scale. Casa Loma’s romantic borrowing from the past, tempered by necessary modern day conveniences, provided the perfect setting. In the height of their years at Casa Loma, the planning of such a busy social calendar consumed much of Lady Pellatt’s time. In addition to hosting grand social events, the Pellatt’s were involved in a number of philanthropic projects. Sir Henry Pellatt was a trustee and benefactor of Trinity College and a strong supporter of Grace Hospital. The organization of the St. John’s Ambulance Brigade in Canada is due largely to his efforts. Lady Pellatt, in spite of her frail health, played an active role in the promotion of Girl Guides of Canada. She was appointed the first Commissioner of the Girl Guides of Canada and in 1919 was honoured with the Girl Guides highest award, the Silver Fish Award. Unfortunately, Sir Henry Pellatt’s fortunes could not sustain the magic that was Casa Loma. To finance expansion, Pellatt and Pellatt went further and further into debt. The one sure source of income from the monopoly of electrical power vanished when political decisions allowed for public ownership of electricity. In a futile attempt to restore his wealth, Sir Henry Pellatt turned to land speculation. He was convinced that well-to-do Torontonians would rush to build homes around Casa Loma. However, in this case his entrepreneurial sense did not take into account the effects of World War I. During the war, Canadians put their money into war bonds, not homes. After the war the economy slumped, tilting Pellatt and Pellatt into bankruptcy. The company owed the Home Bank of Canada $1.7M – or in today’s terms $20M. With his stock worthless and his business debts out of control, Sir Henry Pellatt was faced with a heartbreaking decision – a decision which he would always claim was made for him by the City’s immovable tax assessors. Faced with an extraordinary tax bill, Sir Henry Pellatt had no choice but to auction off his prized possessions for a fraction of their worth and to abandon his dream of a noble castle. The Pellatts moved to their farm in King township in 1924. Lady Pellatt passed away later that year at the age of sixty-seven. Though he lost a great fortune, Sir Henry Pellatt never lost his spirit of philanthropy, a character trait for which he was honoured late in life. His service of fifty years with the Queen’s Own Rifles was celebrated on June 27, 1926 with a march past 500 men complete with the circling overhead of three military planes. When Sir Henry Pellatt died on March 8, 1939, thousands lined Toronto streets to witness his funeral procession. He was buried with full military honours befitting a soldier who had given so much to his country. Sir Henry Pellatt left Casa Loma in 1924. In 1925, one year after Sir Henry Pellatt retired to his farm in King, Ontario; architect William Sparling put forward a proposal to convert the Casa Loma house to a Toronto luxury hotel; The Casa Loma Hotel which was open from 1926 – 1929. William Sparling was granted a long-term lease and began the process of completing the Great Hall and the Billiard Room, areas that Sir Henry Pellatt had never finished. He also had plans to add two large wings to the east and west sections of the main building that would each contain ninety-six full suites and fifty-six rooms. These wings were never built. A New York syndicate offered to purchase Casa Loma in 1928 but the deal was never completed and the hotel failed in 1929. During the late 1920’s, Casa Loma was also a popular nightspot. The Orange Blossoms, later known as Glen Gray and the Casa Loma Orchestra, were booked to play for eight months at Casa Loma in 1927 and 1928. Shortly thereafter, they went on tour of North America with their big band sound. With the onset of the Depression, Casa Loma once again remained vacant. In 1933, the City of Toronto took ownership of the property for $27,303.45 owed in back taxes. Suggestions for possible uses of the building included a highschool, museum or art gallery for visitors to Toronto, a war veteran’s convalescence home and a permanent residence for the Dionne quintuplets. None of the projects proved feasible and the City of Toronto considered demolishing North America’s Castle.Thus, it remained vacant from 1933 – 1937 while proposals were considered by the City of Toronto for the future use. 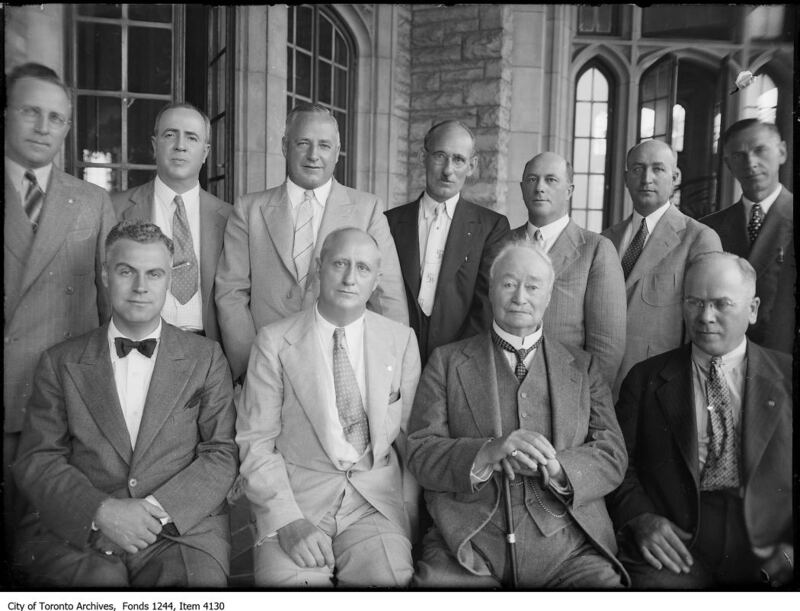 Instead The Kiwanis Club of West Toronto began operating Casa Loma as a tourist attraction in 1937. This agreement continued until 2011. In August 2011, the new Casa Loma Corporation was formed. The City of Toronto remains the sole owner of the property. Sir Henry Pellatt, the dreamer behind Toronto’s famous heritage site; Casa Loma, was born to his British parents in Kingston, Ontario on January 6, 1859. Ambitious from his youth, Sir Henry Pellatt left his studies at Upper Canada College when he was seventeen to pursue a career in commerce in the family business. By the age of twenty-three, he became a full partner in his father’s stock brokerage firm Pellatt and Pellatt. That year was also marked by his marriage to Mary Dodgeson, whom he met when he was twenty. Even as a young man, Henry Pellatt embraced the spirit of the family motto “Devant Si Je Puis” or “Foremost If I Can”. When he met his bride-to-be, Sir Pellatt had already achieved local renown in 1879 for beating the U. S. amateur champion of the one mile race. Travels to Europe gave him the love for fine art and architecture, which would spur his vision of Casa Loma-“House on the Hill.” This romantic side was mirrored by his other lifelong passion-his involvement with the military, specifically the Queen’s Own Rifles.